We regularly offer solar cooker courses in Altötting. Within 5 days the participants learn how the new SK14 2014 is manufactureded and assembled with simple tools. In sunshine we cook naturally with the sun. We will also talk about introduction concepts and financing models of solar cooking programs. EG Solar workshops in developing countries. The achieved knowledge will enable the participants to initiate and teach the building of solar cookers. Maximum 0f 6. If there are only two registrations, the course will not take place and will be canceled. 4 days, Mondays to Thursdays from 9 am to 4 pm. Work clothes as well as writing material are to be brought along. The course costs per participant are € 300,00 incl. VAT. This amount includes all material costs for a solar cooker SK14 as well as a copy of the assembly and construction manual. The participant can take away the self made stove or send it to his place of residence. The costs for packaging and shipping are calculated separately. The participant must provide for this. We would be pleased to send you a list of accommodations and a map of Altötting. When registering (at the latest 4 weeks before the start of the course), the full course fee of € 300.00 is to be paid to the account indicated in the form. If the course can not take place, the full amount will be refunded. 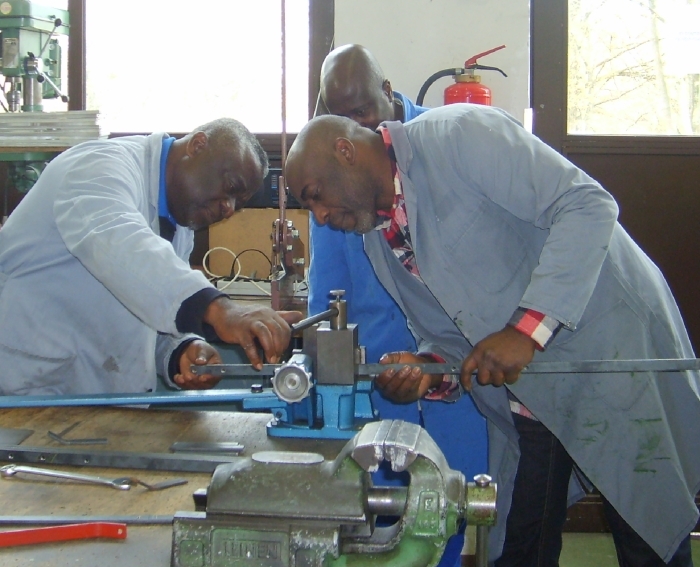 At your request we will come to you to carry out a solar cooker construction course.We offer our mobile workshop for rental (100 € per week). It contains all machines and tools necessary for the production. On request, we can also supply the necessary material for the production. If necessary, we also provide a course instructor. For further information please contact the office of EG SOLAR e.V.